There are a few historical stats that define Michigan Football lore. Michigan leads the country in all of these statistics. But another number has a pretty significant meaning as well...maybe more than all of those others. For most Michigan fans and football alumni the Big Ten title is the most significant earned honor a UM football squad can achieve. Sure, the national title is a higher accolade, but up until 1998 the odds of winning a national title from the Big Ten were, shall we say...low. The last Big Ten school to win the AP national title before the BCS era...prior to when Michigan did it in 1997...was Ohio State in 1968. In the last 48 years, only 2 Big Ten schools have won a national title (while in the Big Ten), so you can see why the league title is held in such high regard among not only the teams, but their fans as well. 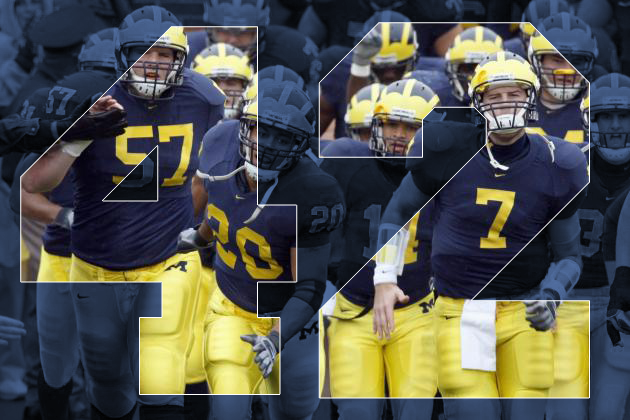 Michigan leads the league with 42 conference titles...a number the Wolverines have been holding on to for the last 12 years. The last time Michigan went this long between league titles was 1950-1964. Since Michigan last won the league title, Ohio State has won 4 of them, Wisconsin has won 4 and Michigan State has won 2. Those were just the outright titles. In the 5 years the Big Ten has had two divisions and a championship game, Michigan has failed to make an appearance, while Ohio State, Michigan State and Wisconsin have dominated the invite list with 8 appearances among them. It is clear that Michigan's lead in B1G titles is dwindling quickly. Ohio State currently sits at 35 and showing no signs of slowing down. There's no question that Michigan is one of the best teams in the conference, but like Harbaugh's pal Ric Flair says "if you want to be the man, you have to beat that man". That could not possibly be a more accurate metaphor for the current state of Michigan football. Without a doubt, Ohio State and Michigan State are the two teams sitting between Michigan and a 43rd Big Ten title. They are the two teams sitting between where Michigan is now, and where Harbaugh wants them to be...between being lost, and being "back". Any rational prognostication about Michigan's 2016 season will surely mention that the Wolverines play both Michigan State AND Ohio State in their stadiums...where Michigan hasn't won since 2007 and 2000 respectfully. A daunting task indeed. The determining factor in each of Michigan's recent losses to both rivals has been getting overwhelmed at the the line of scrimmage. Being able to run the football better than your opponent...and stop them from running the football, typically, results in a better outcome for your team. In recent years, Michigan has been getting smoked by Ohio State's far superior ground game and Michigan State's far superior defense. The hallmark of the Harbaugh offenses at Stanford were the punishing running games. While Andrew Luck made a name for himself under Harbaugh, as did Jake Rudock last year, it was the Cardinal running attack, with the help of a dominating offensive line, that resulted in successful outcomes. That drive is a thing of beauty. I posted this clip in a piece about a year ago and thought about it numerous times during the season last year. That is what I want Michigan football to be...without question. Make no mistake, if Michigan wants a 43rd Big Ten title, they're going to get it the same way they got the first 42...on the backs of their offensive line coupled with a punishing defense. You win the Big Ten with toughness and breaking the will of your rivals. Michigan has been on the bad receiving end of this deal since 2005. They went out and hired Jim Harbaugh to bring exactly what you saw in that video to places like East Lansing and Columbus. I have a feeling year 2 under Harbaugh is going to be a major step in that direction.